Event #16 is over here just shortly after the midnight hour in Las Vegas. 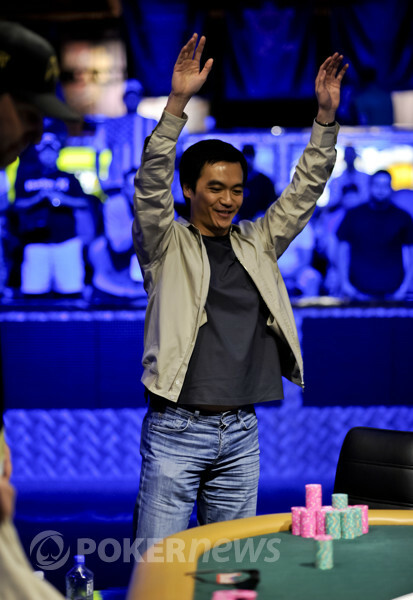 John Juanda has just been handed a WSOP gold bracelet for the fifth time in his career, overcoming a big heads-up chip disadvantage to claim the title in what is arguably the most entertaining event of the Series. Some would say it was meant to be Phil Hellmuth's 12th bracelet party today, four years to the day after he snagged number eleven. Doubters flocked to the rail from the start of play, but Hellmuth stood tall as seven players fell by the wayside. His play was mostly stellar through the first half of the day, and he amassed a huge chip lead as the players dropped one by one. Among them were the 2009 and 2010 champions of this event, Nick Schulman and David Baker, exiting in fifth and sixth places, respectively. The 2004 champion of the whole WSOP, Greg Raymer made it to this final day too, but he would fall in ninth place before the last eight players were relocated to the main stage. Today's story truly was a memorable one, and you'd do well to read back through the blog if you missed any of the action. 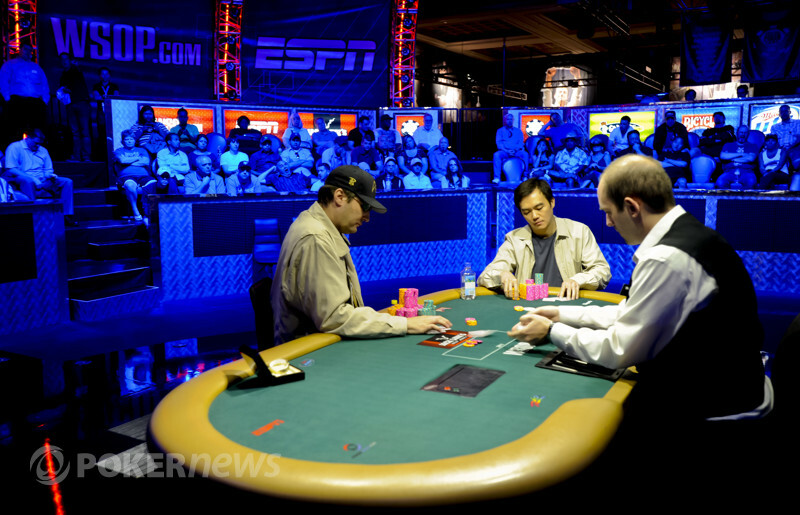 At the dinner break, Hellmuth had more than 2.6 million of the 3.8 in play with three players left. Juanda knocked Richard Ashby out in third place shortly after they returned, though, and he had his sights fixed firmly on Hellmuth's stack. When heads-up play began, Hellmuth still had about a 3:1 chip lead, but Juanda's edge in skill soon began to show through. He picked away at Hellmuth's stack with methodical precision, and the two locked horns in an hours-long tug of war. Many in the poker world consider Juanda to be one of the best 2-7 no-limit players in the world, and he proved that reasoning valid tonight, pressing Hellmuth into a corner as the levels wore on. It was more than three hours of heads-up play before the final series of hands began to unravel. Hellmuth was showing signs of increasing frustration over the last hour or so, and Juanda thrived on the opportunity to quietly get under his opponent's skin. After fighting with such a strong pose for so long, Hellmuth began to look a bit downtrodden and unpleasant, sinking in his chair and mumbling under his breath. In the final hand, he got his money in pat with a queen, and Juanda drew live to his jack to lock up the bracelet. Hellmuth was sincere in his congratulations, it appeared, admitting he was scared of Juanda's heads-up game. John Juanda finished in fourth place the last two years in this event, and he began this final day dangerously short on chips at the bottom of the heap. Apparently the third time's the charm. Nine hours later, he sits alone at the table with all 3.78 million chips in play. And a shiny new bracelet. 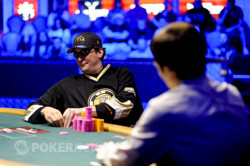 It's number five in his career, and it comes with the extra bragging rights of denying number twelve for Mr. Hellmuth. We hope you've enjoyed the spectacle from the Rio tonight. For now, this night stands alone as the marquee scene thus far in the 2011 World Series of Poker. But there are still another 40 events to be played, and we can nearly promise more moments like tonight. Until tomorrow, then, all that's left is goodnight! Oh, and a huge congratulations to our new champion, John Juanda! From the button Phil Hellmuth moved all in for his remaining 555,000. Juanda looked at his hand several times before finally making the call. Juanda flipped up and determined that he was the favorite. Juanda slowly squeezed the cards, his hands shaking feverishly with anticipation. "It's not paint", Juanda remarked. He looked at the card fully and then slapped the on the table, completing his jack low and officially marking the defeat of Phil Hellmuth heads up. The crowd erupted into cheers and Juanda waved to audience, expressing his gratitude for their support. In stopping Hellmuth's quest for a 12th bracelet, Juanda was able to grab his 5th. After the match, Hellmuth shook Juanda's hand and said " Well played buddy, well played. You're just so f***king scary." Hellmuth won't be leaving the Amazon Room with a 12th bracelet today, but he will be pocketing $226,907 for his efforts. 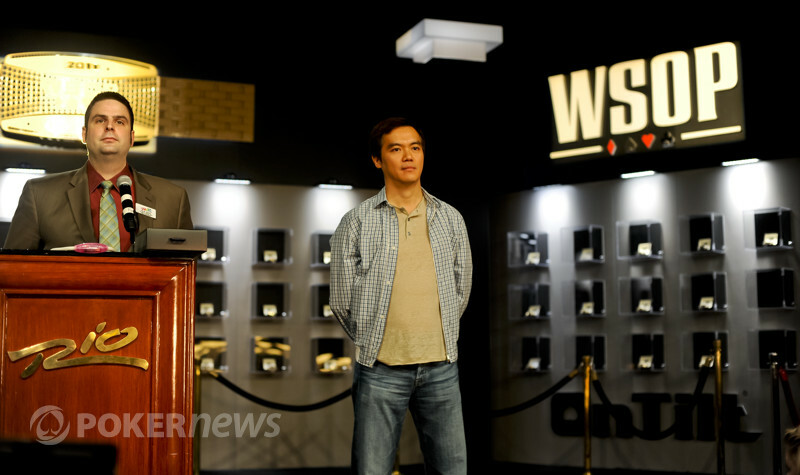 Phil Hellmuth raised to 125,000, and John Juanda made the call to proceed. Hellmuth took two new cards, and Juanda just one again. Once again, he led out -- 275,000 this time. Hellmuth didn't waste any time with the call, and they were chips he'd not get back. Juanda showed , and Hellmuth nodded slowly. He's reached the quiet, resigned stage of frustration now, quietly mucking and looking down scornfully at his stack. John Juanda raised to 115,000 at the new level, and Phil Hellmuth made the call. Hellmuth needed two cards, and Juanda took just one. Hellmuth knocked the table, and Juanda fired out 250,000. 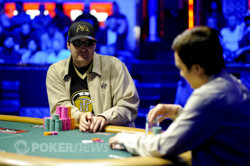 It was plenty enough as Hellmuth quickly folded, down now under the million-chip mark. After the hand, he started complaining about some small issue with the automatic shuffler. 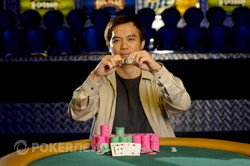 John Juanda opened to 85,000, and Phil Hellmuth three-bet to 350,000 with a hint of frustration on his face. That's not exactly unique to right now, though. In any event, Juanda let it go without much incident. John Juanda raised it up to 85,000, and Phil Hellmuth called. 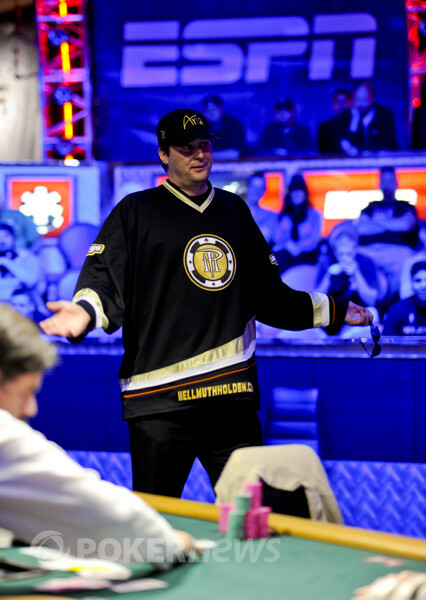 We missed the drawing round (sorry), but we saw Hellmuth lead out with a bet. Juanda shoved on him, and Hellmuth could not call. He flung his cards muckward, and he's down to 1.05 million as the slide continues. Juanda has really picked up the pace here. "Honey! I Just Saved My Life!" John Juanda popped it up to 90,000 and was called by Phil Hellmuth. Both men drew one card and the action went check-check. Hellmuth turned up a winning . "Here! Show him! Show him what I threw away!" Hellmuth said to the dealer, reaching into the muck. Hellmuth picked out and showed it to Juanda. "You were supposed to bust me there! Tournament over! Anyone else shoves there with jack low, then you pull the ten and tournament over! I just had a bad feeling about the jack!" "The great Phil Hellmuth instincts" said Juanda with a smile. But Hellmuth wasn't done with his jubilation there. "Honey!" Phil shouted into the crowd toward his wife. "I just saved my life! He was supposed to bust me there but I just saved my own life!" Hellmuth is now sitting with 1,000,000 in chips to Juanda's 2,800,000.